One would have to go back a long way to see as ignorant a foreign minster as Canada’s pit bull, John Baird. His latest fulminations regarding Israel/Palestine are so over the top and incredulous as to make one wonder what planet Baird lives on. No mention of Palestinian suffering, humiliation or recipients of the longest occupation in post war history; no mention of consistent crimes against international law. Tired and confused ranting about Israel as victim! That’s right.The country with the 5th largest army, backed by nuclear weapons and the mighty US has now in Baird’s mind become poor little David. And this guy is Canada’s Foreign Minister. The craven US president Barack Obama states that unilateralism is not a good approach in international relations. In this he is correct. Neither is eating a pizza while arguing over who gets what. The Palestinians have watched Israel “eating the pizza” while supposedly negotiating. The only problem is, given the drastic asymmetry in power relations—a very powerful state Israel backed by the hegemony the USA has done what it wants with the Palestinians. They do it because they can. Not only that more of the pizza was eaten by the Apartheid Wall.Experts reckon 5-10% more stolen land. The US wrings its hands and does nothing. Now all of a sudden President Obama and his loyal surrogate Canadian PM Harper have the chutzpah to tell the long-suffering Palestinians we’ll tell you when you can apply for statehood. The Toronto International Film Festival is now in full bore and indeed “full of bores” who can find nothing better to do with their trvial lives. Even with Madonna in town. I wonder what is it that takes people down to these banal photo shoots of celebrities? Are their egos so weak that they need to be near the rich and the famous? Television I have conclude has been an overall disaster, failing the hopes and dreams of its earliest promoters.It has succeded in delivering the image into millions of homes and increasing the desire to be famous.All surveys point to the dramatic rise of individuaism and egoism. The public remains ill-informed and massively distracted.How else can you explain Rob Ford as mayor of Toronto? 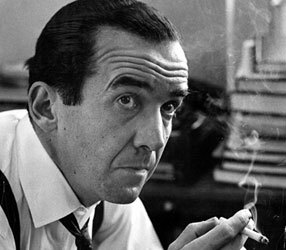 Edward R Murrow saw the deleterious trends in 1958. So spoke Pope Benedict in his last encyclical Charity in Truth in 2009. One would have thought that bishops would have taken their signal from Rome regarding the dismal situation of labour in our time. Labour—not just another commodity as the Church has always taught. is suffering terribly in the new global economy.Decades of cut backs, attacks,the shocking advance of corporate greed has pummeled human beings into the ground. One of the flyers handed to me was from CUPE who represent Air Canada flight attendants, the front line of safety for those who fly.They have watched, like many other workers, their wages stagnate , their salaries rolled back all the while their CEO has just received a 77% wage increase. For over an hour I stood on the corner of Tecumseh (my boyhood street) and Queen with my wife and teacher-daughter. 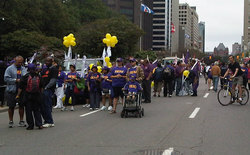 We watched the passing parade of unions on this Labour Day.always a sacramental experience for me. I was waiting for the Catholic teachers Union to come by so I could join in and walk among them as a small act of solidarity for the beleaguered workers of Ontario. But the official representatives of the Way and the Truth, Catholic Church leaders were nowhere in sight. Every year I would see Jack Layton marching with OPSEU, CAW, ACTRA (yes cultural workers have unions) machinists, librarians,city workers, hotel workers the most exploited of all—and most of them people of colour. Never have I seen any of the bishops of Ontario walking in solidarity with these good people who build our city and make life work. At my coffee shop to pur salt into the wound I noticed the smug Toronto Sun crowing about the end of public service unions and why not, while we are at it, let’s give another name to Labour Day. It’s sad enough when so few Catholic teachers walk every year with their brothers and sisters in much less remunerative work and always in greater jeopardy, but it is doubly sad when the so called institutional leaders of the Catholic Church are nowhere in sight. Are these men so busy or are they just obtuse about the need to express solidarity in the age of Stephen Harper and Toronto’s Rob Ford? “Jack” always made time for these workers. I saw him for over 20 years encouraging working people on this Day of Labour. “Their excellencies” I have never seen, nor many of the diocesan clergy. They apparently don’t know jack about the meaning of witness or solidarity. Look no further than every Labour Day for reasons why the Church is in decline. The former cardinal of Toronto Aloysius Ambrozic recent death was totally eclipsed by the very public state funeral of NDP leader Jack Layton. There is a tragic irony here. If one ever needed proof that that organized religion and in particular that of the largest denomination in Canada,Roman Catholicism had lost voice and the power to inspire, it was the phenomenal outpouring of emotion over Layton’s passing and the almost eerie silence over the cardinal’s passing. For many Canadians Jack Layton had become the signifier, the one who pointed to the values of God’s reign as understood in the bible. In our midst in a place where we least expected it, in a city where bank towers had replaced churches as urban symbols of what we valued, Canadians mourned not a religious figure but a different politician, the leader of the New Democratic Party. It was here not far from “Bay Street” that a man sprouted up from among us who never mouthed the name Jesus but who lived Jesus in his consistent defense of the marginalized. Like an Old Testament prophet. Layton did not offer dead ritual which did not go anywhere. He did not spout pious phrases behind institutional walls. In his effervescent way “Jack” walked the walk of the Hebrew prophets and the Galilean rabbi. He did it on the streets of the city and in its council chambers.He did not offer charity but demanded justice. For decades we watched him advocate for the homeless, for those “born outside the inn”, for those excluded. We saw him defend gay and lesbian people denied rights and jobs; we saw him speak out and organize the White Ribbon Campaign against violence on women; we walked with him on peace rallies when no prelates were in sight;we admired his bike-riding to work and his defense of the environment Jack Layton was consistently on the right side of history. The fact that the former cardinal of Toronto died at the same time with little fanfare and the leader of Her Majesty’s Opposition elicited such an outpouring of love and admiration is a tragic irony which needs to be unpacked within the walls of the Roman Catholic Church and indeed all of organized religion.